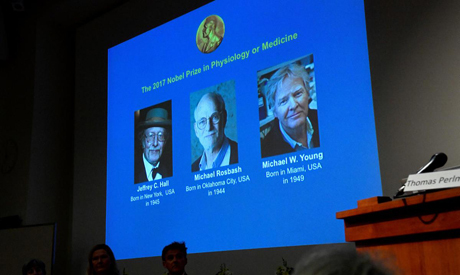 U.S. scientists Jeffrey Hall, Michael Rosbash and Michael Young won the 2017 Nobel prize for medicine on Monday for unraveling molecular mechanisms that control our internal body clocks. These help explain how people experience jet lag when their internal circadian rhythms get out of sync, while also having wider implications for disorders ranging from insomnia to depression to heart disease. Chronobiology, or the study of biological clocks, is now a growing field of research thanks to the pioneering work of the three scientists, who explained the role of specific genes in keeping fruit flies in step with light and darkness. Today, scientists are exploring new treatments based on such circadian cycles, including establishing the best times to take medicines, and there is an increased focus on the importance of healthy sleeping patterns. “This ability to prepare for the regular daily fluctuations is crucial for all life forms,” Thomas Perlmann, secretary of the Karolinska Institute Nobel Committee, told reporters. Rosbash said the news that the trio had won the Nobel prize, which is worth 9 million Swedish crowns ($1.1 million), was “a little overwhelming”. “It took my breath away, literally. I was woken up out of deep sleep and it was shocking,” he told Reuters. Hall, most recently of the University of Maine, collaborated with Rosbash while they both were at Brandeis University in Waltham, Massachusetts. They split the prize with Young of Rockefeller University in New York City. Scientists were already pondering the concept of body clock genes in the 1960s and 1970s. Then, in the mid-1980s, the three laureates used fruit flies to isolate a gene called period that controls the normal daily biological rhythm and showed how it encodes a protein called PER that accumulates in cells during the night and degrades during the day. Further research revealed the role of other genes in the complex system. Young said the trio could not have anticipated that the whole system could be revealed in their lifetimes, but new scientific tools helped accelerate the work. Their discoveries help explain how plants, animals and humans adapt their biological rhythm to be in synch with the Earth’s revolutions. Scientists now understand that body clocks influence alertness, hunger, metabolism, fertility, mood and other physiological conditions. And researchers have begun to study the implications of erratic sleeping and working patterns or children who stay up late. The prize has not been without controversy, especially with the benefit of hindsight, such as the 1948 award for the discovery of DDT, a chemical that helped battle epidemics but was later banned due to its harmful environmental impact.